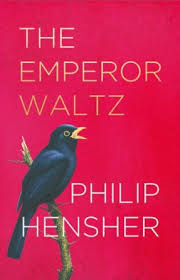 In an extended review of Philip Hensher's The Emperor Waltz published in a recent issue of Prospect Magazine, Sam Sacks writes of "the rise of time machine fiction." "The smooth, uninterrupted passage from a beginning to an ending," he suggests, "has fallen out of favour. Instead, books that juxtapose multiple stories from different periods in time ... have grown into a genre of their own." He cites A.S. Byatt's Possession, David Mitchell's Cloud Atlas and, most recently, The Emperor Waltz, as examples of this genre. In contrast to H.G. Wells's The Time Machine, none of the characters in these novels actually travels in time. It is the reader who is presented with the illusion of doing so. Sacks sees this "time machine fiction," however, as the "offspring" of a creative tension between Wells and his contemporary, Henry James, "combining the Jamesian attention to character we associate with modern 'literary fiction' with the high-concept didactic approach of Wells," and he traces a line of descent from James and Wells through Richard Powers's Three Farmers on their way to a Dance; to Possession, Cloud Atlas and The Emperor Waltz. 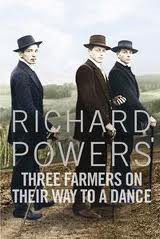 Richard Powers's Three Farmers on their way to a Dance takes, as its starting point, a photograph of three young men taken in 1913 or 1914 by the German photographer August Sander. It explores modern themes in the history of photography and technology as well as presenting the fictionalised lives of the three men as their lives unfold after the photograph was taken. 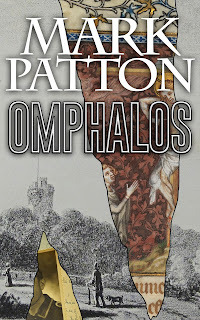 It was certainly Cloud Atlas, together with Katie Ward's Girl Reading, that inspired me to write my own "time machine novel," Omphalos, which will be published later this year. The form seemed to me to suit my purpose in exploring, through fiction, the history of a specific place that I have previously explored through non-fiction. Having hit upon this idea, I sought further inspiration from a re-reading of several novels that seemed to me to be doing something similar, but these were not the ones on Sacks's line of succession. 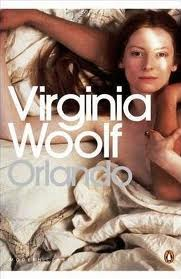 The first was Virginia Woolf's Orlando, which he does mention in passing. For me, this is, perhaps, the first, and probably also the greatest of these novels, taking the reader on a breath-taking waltz across four centuries of European and Asiatic history. I turned then to Italo Calvino's If on a Winter's Night, a Traveller... and Invisible Cities. 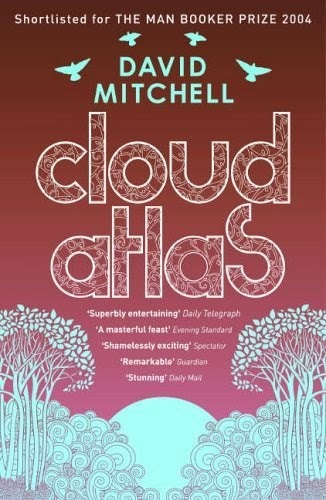 David Mitchell has acknowledged Calvino as the primary influence on Cloud Atlas, and it is from Calvino that both Mitchell and I derive the structural form of Cloud Atlas and Omphalos, the idea of a story within a story within a story, like a series of nested Matryoshka dolls. 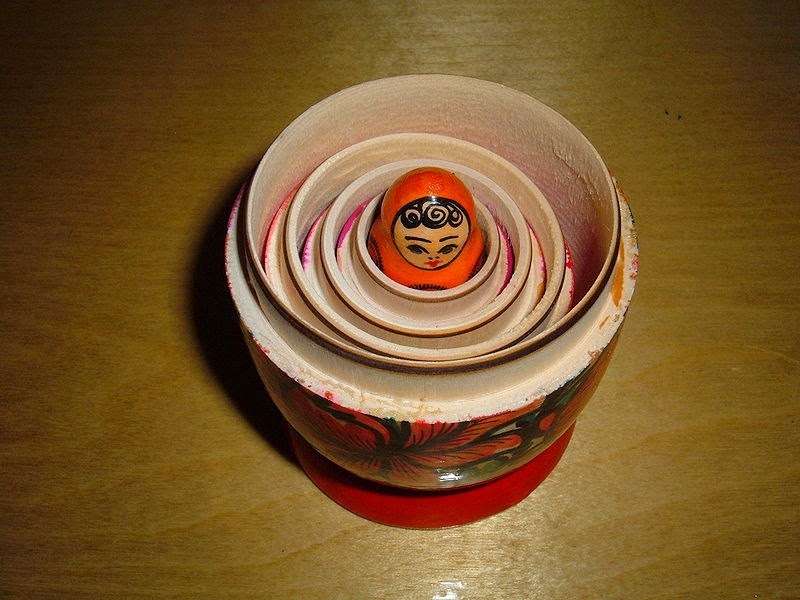 Russian Matryoshka dolls. Photo: BrokenSphere/Wikimedia Commons, licensed under GNU. In my case, the specific stories, and the periods in which they are set (the present day, the 1940s, the 1790s, the 1510s, the 1160s, the 5th Millennium BC) are suggested by the specific place that inspired Omphalos, even though two thirds of the action of the novel takes place elsewhere (Normandy, Brittany, Venice, Crete, Jerusalem, Galicia, Gascony). I could have added a story set in the 1920s, and another set in the 1880s, but I judged that the novel was long enough without them, and I didn't feel that they would necessarily add much to the underlying themes of transgression and reconciliation, and of people finding themselves on the wrong side of history. I read Kate Atkinson's Life after Life (like Orlando, it is an unusual variation on the theme of a "time machine novel") whilst I was editing Omphalos, and quickly realised that she and I had drawn on some of the same historical sources. I wanted to make sure that I did not use the same vignettes, and edited some of my paragraphs accordingly. In his review of The Emperor Waltz, Sam Sacks identifies a number of "traps" into which the writer of "time fiction novels" can easily fall. First there is " ... the danger of devolving into a kind of interpretive game, a lit-crit mystery whose meanings must be decrypted rather than naturally perceived. Authors unbounded by time are susceptible to the allures of omniscience, which can turn their characters into puppets and snuff out the lifelike vitality of the realist tradition." 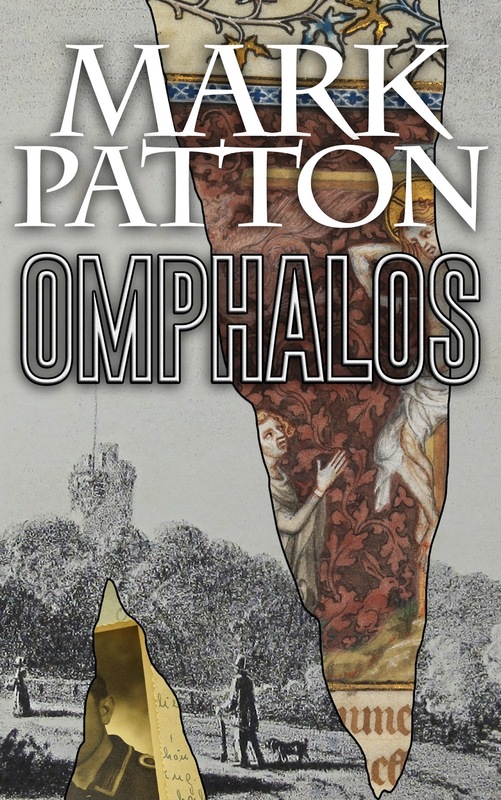 Certainly there will be elements of mystery in Omphalos, as there are in most good novels, but these elements are secondary to the main arc of the stories. I have tried to avoid the allure of omniscience by telling each story in a different format: a series of letters in one case; diary entries in another; a 16th Century travelogue; an imagined oral narration. These are testaments which do not, in fact, exist, but which could have done. In each case I researched the genre, examining real wartime letters at the Imperial War Museum; real 18th Century diaries and 16th Century travelogues at the British Library. 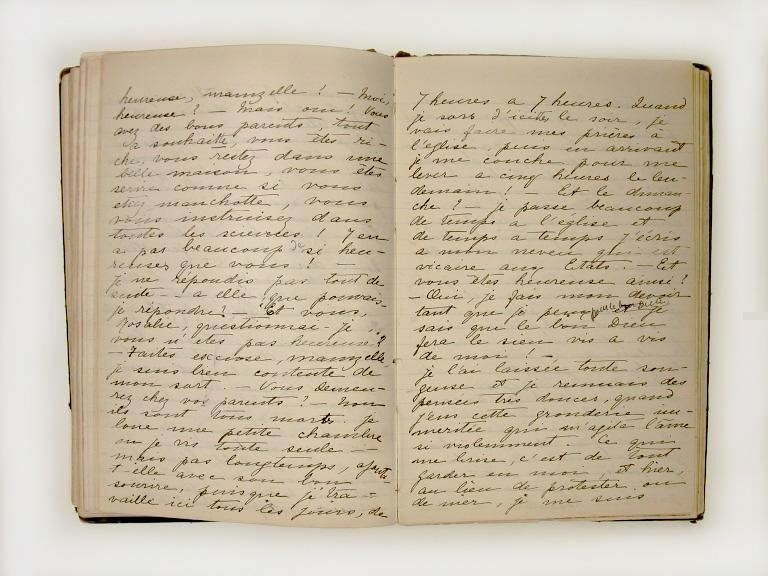 The diary of Henriette Dessaules, McCord Museum (Image is in the Public Domain). Second, there is the risk of "mysticism," with overreliance on "connecting devices." "Connection itself becomes their overarching theme as they assert a bond between the past and the present (and sometimes the frighteningly unknown future) based on the constants of human nature, national heritage, or family ties." In Omphalos, the main "connecting device" will be a physical place, but there are also objects from one period which crop up in another, and suggested (but not explicitly stated) family ties across the generations, but these, again, are secondary, and, although the characters in each story face problems that arise from "the constants of human nature," their cultural backgrounds lead them to face these problems in very different ways. There is an implied question, here, about the resources we have (or lack) to confront these problems ourselves, but this is a question for the reader. Like George R.R. Martin, "I'm not the sort of writer who gives answers. I prefer to raise questions." Finally, there is the risk of didacticism, tilting a work "far more towards H.G. Wells than Henry James." In the case of Omphalos, I hope that the fact of having already told part of the story in a non-fictional context has innoculated me against any temptation towards didacticism in the novel itself. The non-fiction is about the stories we know; the novel is about the stories we do not, and cannot know, and is entirely narrated through the subjectivities of the characters (there will be nine protagonists, all but one of them fictional). "Today," Sacks asserts, "'time machine fiction' reigns supreme." 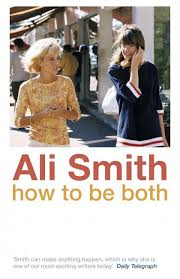 Certainly it is now an established sub-genre (other examples are Sarah Waters' The Night Watch, and Sebastian Faulks' A Possible Life) and, of the thirteen books currently long-listed for the Man Booker Prize 2014, one clearly belongs within it (Ali Smith's How to be Both), whilst three others have some elements of similarity to it (Siri Hustvedt's The Blazing World; Howard Jacobson's J; Niall William's History of the Rain). 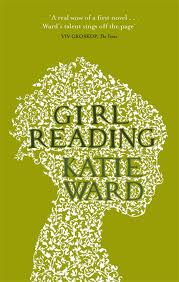 There is also room on the list, however, for a more conventional work of historical fiction (Richard Flanagan's The Narrow Road to the Deep North) and for Paul Kingsnorth's The Wake, which, like Jim Crace's Harvest last year, distinguishes itself mainly through its highly imaginative use of language. "Time machine fiction" is not the only show in town by any means, but it is emerging as one of the distinguishing literary tropes of the early 21st Century. Literate civilisation in China has its origins in the Shang Dynasty (c1200 BC) and, remarkably, the written characters of the period are still recognisable to modern readers of Chinese, making it the oldest surviving written language in the world. From the time of Alexander the Great, who established a series of Hellenistic cities in the territory of what is now Afghanistan, a trade network existed, linking China and India to the eastern shores of the Mediterranean. This "Silk Road" was not a road in the sense that the Appian Way was a road, and nor was silk the only commodity traded along it (Indian spices, such as cumin & pepper, transformed the culinary culture of the Mediterranean world): it rather took the form of a series of understandings between chains of adjacent communities which collaborated on an informal basis to facilitate the transfer of goods and ideas. 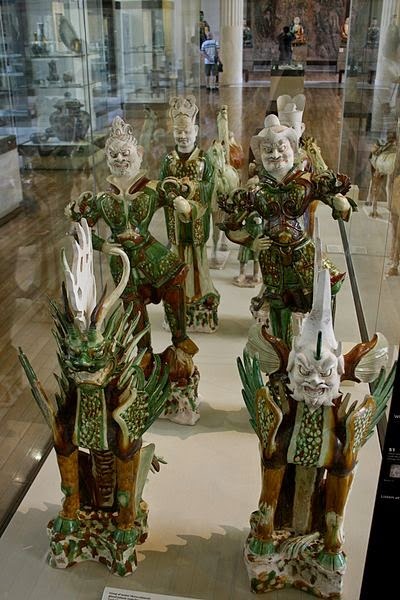 "Sancai" figures of the Tang Dynasty, c 728 AD, at the British Museum. Photo: Mike Peel (www.mikepeel.net) - licensed under CCA. Depicted are two guardian figures, two officials (one civil, the other military), two heavenly kings, two camels with an attendant, and two horses with an attendant. In 629 AD, a Buddhist monk named Xuanzang left the Chinese capital, Chang-An (Xi'an) on a journey to India, with the primary aim of gathering Buddhist scriptures to return to China. His journey took him through Kyrgyzstan, Uzbekistan & Afghanistan (it is from his account that we have the first written record of the great Buddha statues of Bamyan, destroyed by the Taliban in our own times). 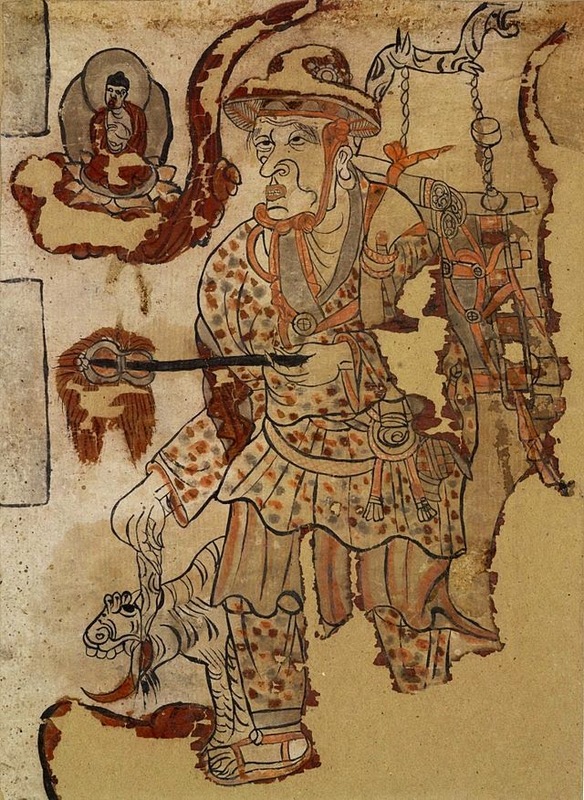 9th Century representation of Xuanzang, Dunhuang Cave (image is in the Public Domain). 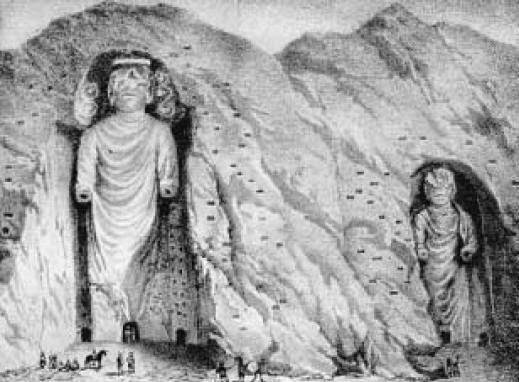 The Buddha statues of Bamyan, as depicted by Alexander Burns in 1832 (image is in the Public Domain). Xuanzang visited on 30th April, 630 AD, and recorded a third, reclining statue, subsequently lost. 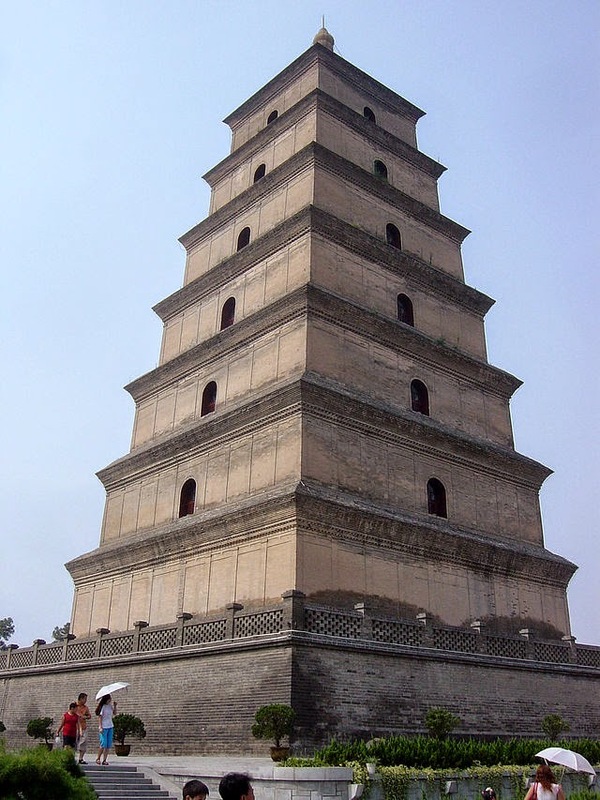 Xuanzang arrived in India in 630 AD, and travelled extensively there, finally returning to Chang-An in 645 AD, where he joined the Da Ci'en Monastery, and led the building of the Wild Goose Pagoda to house the scriptures he had brought back from India. The Wild Goose Pagoda. Photo: Bobak Ha'Eri (licensed under CCA). The non-fiction account of Xuanzang's journey, The Great Tang Records of the Western Regions, compiled by his disciple, Bianji, is standard reading for anyone writing about the Silk Road, but English translations of it are rare and expensive. 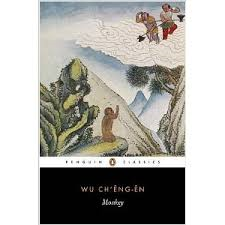 Wu Cheng'en's novel, written during the Ming Dynasty (1368-1644), takes Xuanzang's account as a starting point, but weaves a series of fantastical tales around it, in which Tripitaka (the name he uses for Xuanzang) is accompanied on his journey by a monkey-spirit (Sun-Wukong, or "Monkey"), a pig-spirit (Zhu-Baijie, or "Pigsy") and a river ogre (Sha-Wuqing, or "Sandy"). Tripitaka and his companions, as depicted at the Summer Palace, Beijing. Photo: Rolf Muller (licensed under GNU). Together, they encounter a variety of natural and supernatural beings, and have to find ways of cooperating with one another in order to overcome them. It is a picaresque and comic masterpiece with a serious underlying spiritual message of redemption and enlightenment. It is also a portrait of China as it saw itself in Wu Cheng'en's time, with a complex intermix of Confucian, Taoist and Buddhist ideas superimposed on enduring ancient folk beliefs. The original Chinese novel is very long (as is Bianji's factual account), and almost all English translations are abridged. Over the years, I have dipped into several rare library editions, but the most readily available is the Penguin edition of the translation by Arthur Waley. "'I am the Great Sage Equal of Heaven,'" said Monkey. "'Five hundred years ago I made trouble in the Halls of Heaven, and Buddha clamped me down in this place. Not long ago the Bodhisattva Kuan-Yin, whom Buddha had ordered to look around for someone to fetch scriptures from India, came here and promised me that if I would amend my ways and faithfully protect the pilgrim on his way, I was to be released, and afterwards would find salvation' ... "
"When the wind subsided there appeared a monster of truly terrible appearance. He had short bristles on his swarthy cheeks, a long snout and huge ears. He wore a cotton jacket that was green but not green, blue but not blue, and had a spotted handkerchief tied round his head ... Monkey caught hold of him and making a magic pass changed himself back into his true form... When Pigsy turned and saw Monkey with his sharp little teeth and grinning mouth, his fiery, steely eyes, his flat head and hairy cheeks, for all the world like a veritable thunder-demon, he was so startled that his hands fell limp beside him and his legs gave way. With a scream he tore himself free, leaving part of his coat in Monkey's hand, and was gone like a whirlwind ... If you do not know how far he chased him or which of them won the fight, you must listen to what is told in the next chapter." In strictly chronological terms, this book and the next might be thought to appear on my list in the wrong order, but this post seems to follow on more logically from the previous one and, as we shall see in the next, placing some works in any chronological succession is a complex matter. The peoples of Scandinavia had never been subject to the Roman Empire, and had developed a rich cultural and artistic tradition with roots going back deep into prehistory. In the 6th, 7th and 8th Centuries AD, as Gaul and Britain recovered from the chaos of the empire's collapse, these Norse cultures seized the opportunity to expand. Between 793 and 850 AD, Viking raiders attacked monasteries and towns along the east coast of England. The raids were followed by settlement, and the emergence of Norse cities such as York and Dublin, linked by trade networks that extended through Russia as far as the Black Sea and the Byzantine Empire. For some, however, the old world was not enough. If there was an ocean, there must surely be something on the other side of it, and the Viking trading ship, the Knarr, provided them with the means of exploring it. 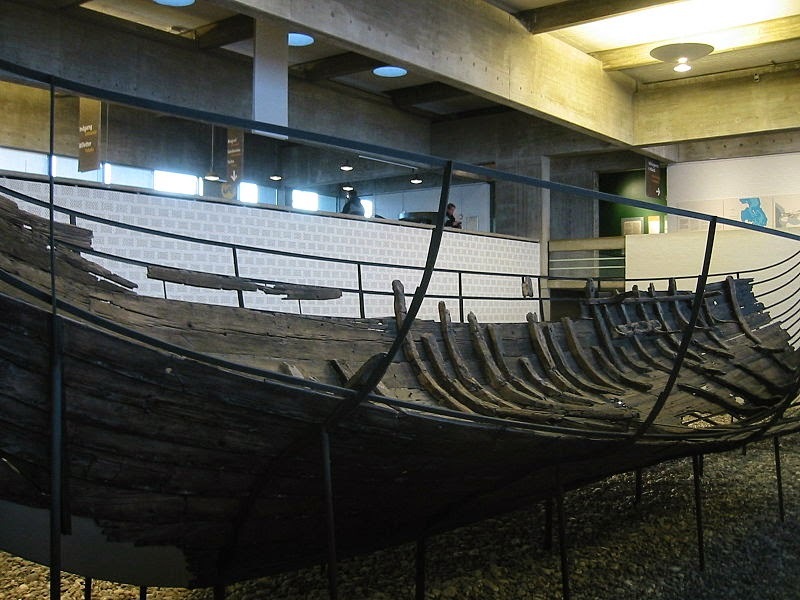 The Skuldelev 1 ship, a knarr (large cargo ship) found in the Roskilde Fjord, Denmark. Photo: Elgaard (licensed under GNU). 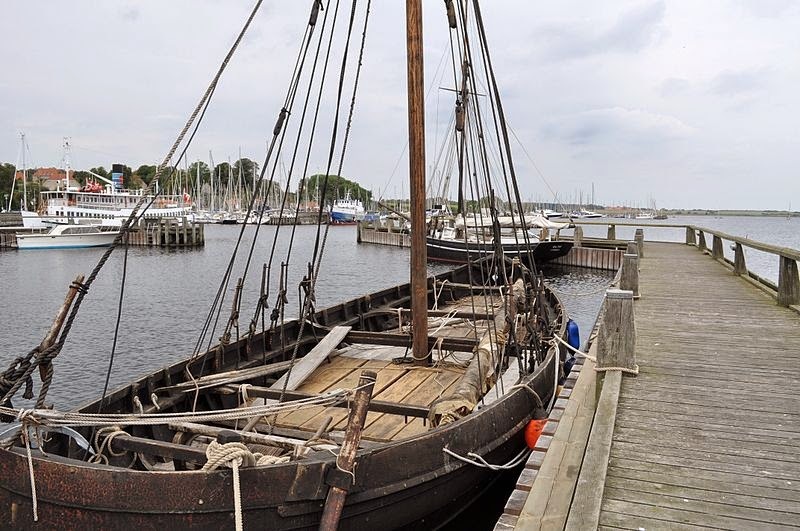 A reconstruction of Skuldelev 1 in Roskilde's Viking Ship Museum. Photo: Boatbuilder (licensed under CCA). In the last years of the 9th Century, a Norse settlement was established on Iceland and, in less than a hundred years, the settlement of Greenland had begun. 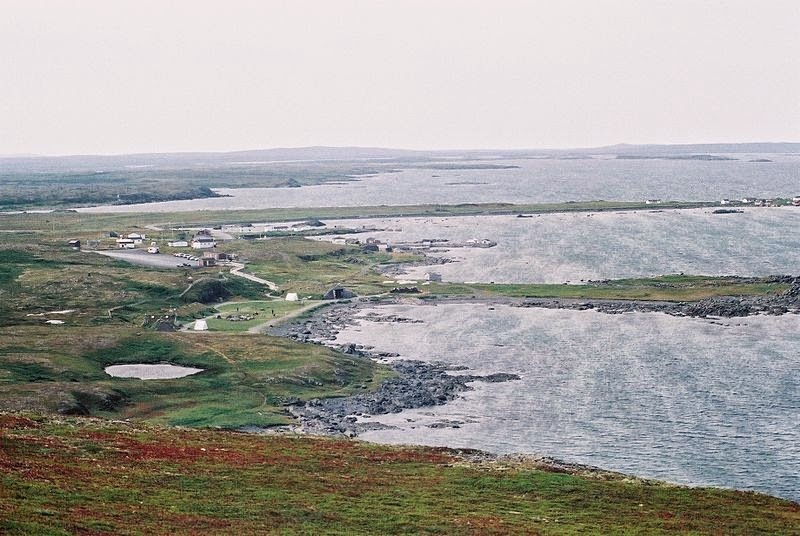 The settlement of Brattahlid, on Greenland, was established in the 980s by Eirik the Red, banished from Iceland for killing a man. 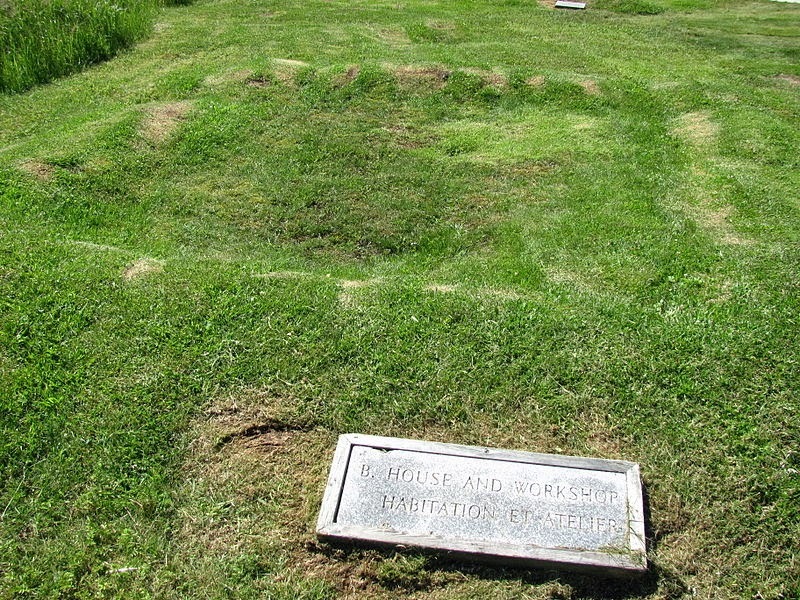 Eirik's son, Leif, sailed west and landed on the coast of Newfoundland in 1002, and this was followed by further expeditions over the next few years. This is the first documented contact between Europe and the Americas, and it continued, at least sporadically, until the 14th Century. 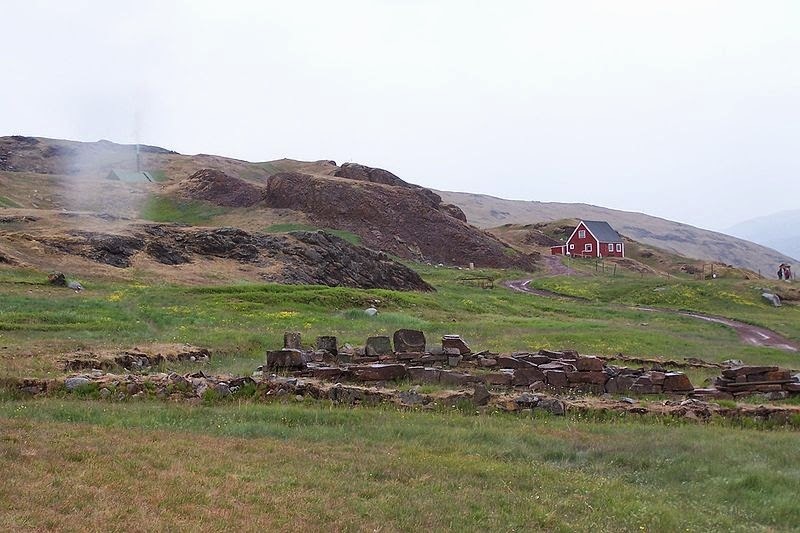 The ruins of Eirik the Red's setllmenet at Brattahlid, Greenland. Photo: PederM (licensed under CCA). 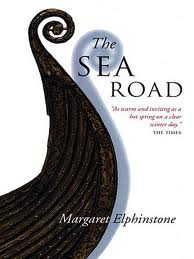 Margaret Elphinstone's novel, The Sea Road, is a first person account from the point of view of Gudrid Thorbjarnardottir, one of the first European women to make a life in the Americas. A historical figure, Gudrid was born in Iceland, travelled to Greenland with her father, and was married three times, first to a merchant named Thorir, then, after his death, to Eirik the Red's son, Thorvald, and finally to another explorer, Thorfinn Karlsefni. Thorfinn and Gudrid's son, Snorri, was probably the first European to be born in the Americas. After Thorfinn's death, Gudrid converted to Christianity, and made a pilgrimage to Rome. In the novel, she recounts her story to Agnar Asleifarsson, an Icelandic monk in Rome, and we hear his voice as well as hers. Sometimes she addresses him (and, through him, the reader) in the second person and, in other passages, Elphinstone presents Gudrid's thoughts to us in the present tense. Asleif: "I wrote down her story in obedience to a command from Cardinal Hildebrand in Rome. When she arrived there first, he received her, and later he sent for me. These were his words. 'A woman has arrived here on pilgrimage from your country ... This woman, apparently, is one of those who have gone beyond the confines of the mortal world, in the body. She has dwelt for over a year in the lands outside the material world. She has talked with demons and with the ghosts of the dead ...'"
L'Anse aux Meadows, Leif Eirikson's settlement on the coast of Newfoundland. Photo: Gregory Matthews (licensed under CCA). Gudrid: "You must understand, Agnar, that the plan was to make a trading post in Vinland, not a farm. None of us wanted to settle permanently so far out of the world, at least, not until the trade was coming, and then the place might attract settlers. Leif and Karlsefni wanted to make sure of their own rule before they encouraged anyone else. 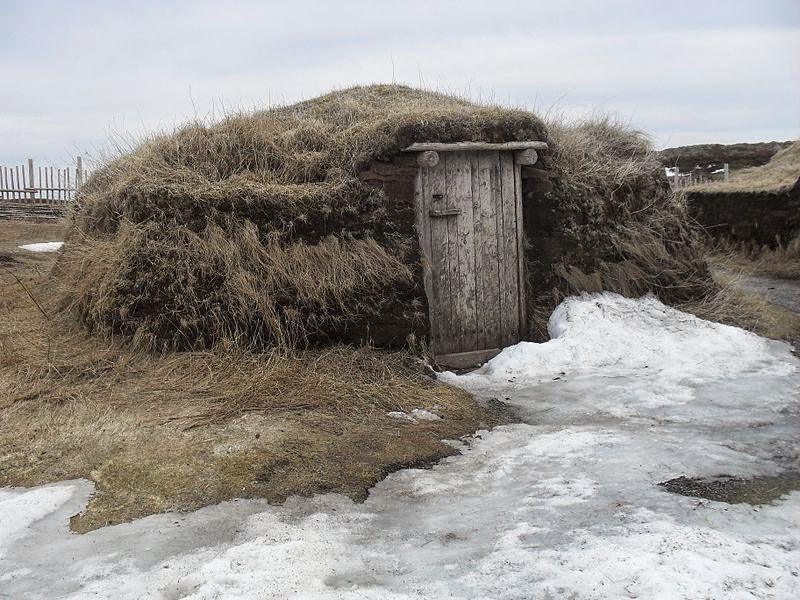 So we were to build up Leif's houses into a winter settlement that could be a base for all future expeditions." The remains of a Viking house at L'Anse aux Meadows. Photo: Torbenbrinker (licensed under CCA). Reconstructed house at L'Anse aux Meadows. Photo: SemanticsDavid (licensed under CCA). Elphinstone: "The ghosts gather in the shadow of the mountain, and look down on Sandnes. They see a patch of green pasture, hayfields in squares like blankets spread to dry. They see buildings like spindlewhorls hanging by the threads of paths woven by hooves and footsteps. A strip of shore hems the settlement, and needle-shaped boats are tucked in here and there along its length. The ghosts see how carefully made the place is, how neatly it is threaded together, but how fragile the green material is, spread between the bare rock and the sea." This mixed narrative style could easily make for a fragmented account but, in Elphinstone's hands, it really does give the impression of a series of dialogues stretching out across the centuries. By the middle of the 4th Century AD, most of England was thoroughly Romanised. Christianity was, by this stage, the official religion of the Roman Empire, but Christian and pagan imagery are often found alongside one another in the archaeological record, sometimes under the same roof. 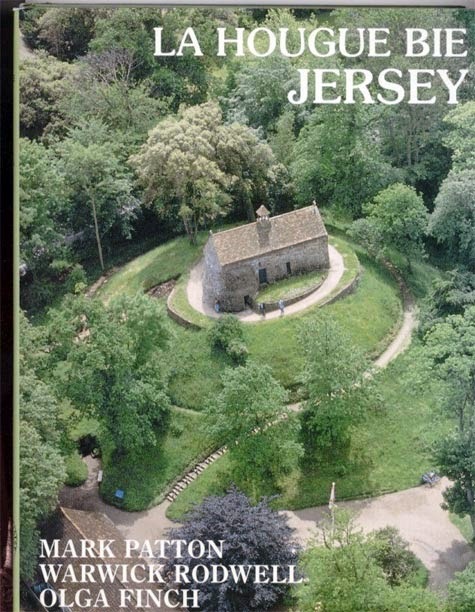 On the rich farmland of Southern England, some families had amassed considerable wealth, and this may have attracted the attention of pirates from northern Germany. 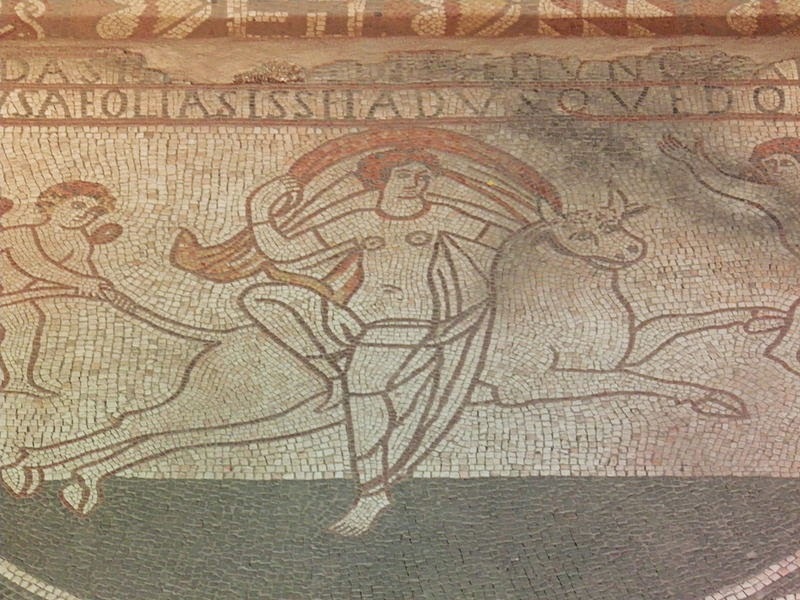 Mosaic from Lullingstone Roman Villa, showing Europa and the bull. Photo: Carole Raddato (licensed under CCA). 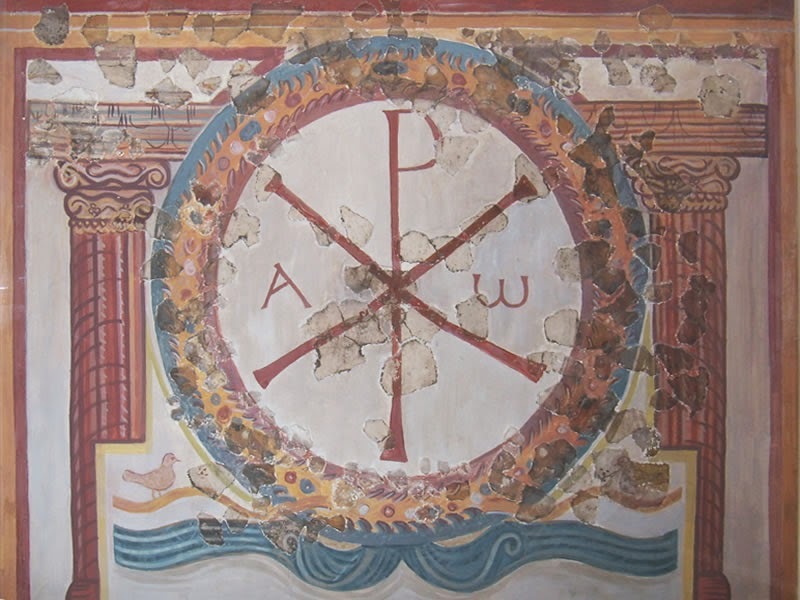 Christian "Chi-Rho" symbol painted on the wall of the same villa. Photo: Udimo (licensed under GNU). 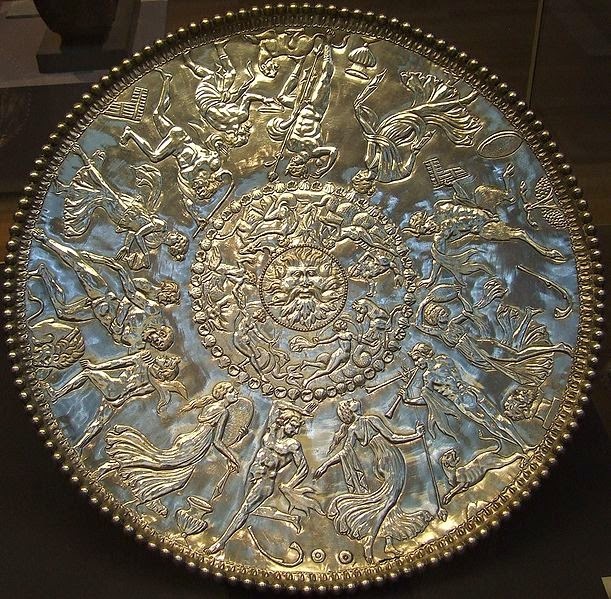 Silver plate from the Mildenhall hoard, showing a Bacchic scene. Photo: JMiall (licensed under CCA). 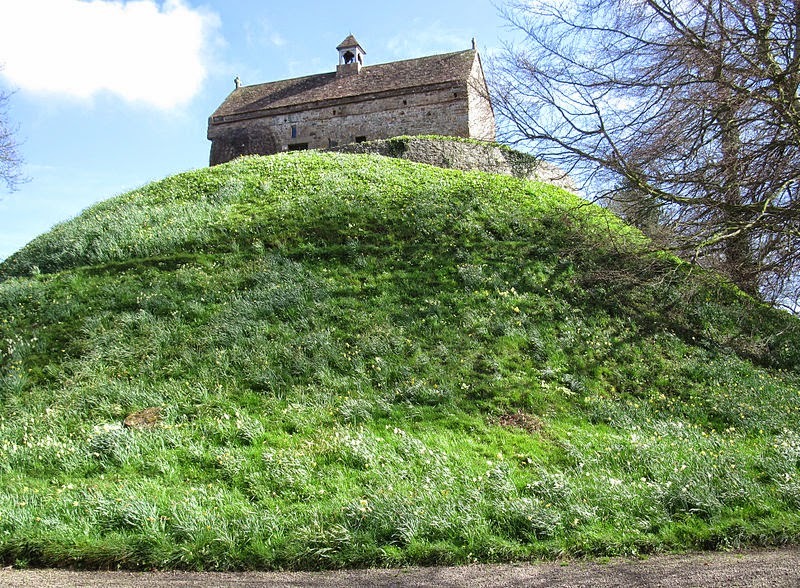 From around 290 AD, a series of forts were established along the coasts of southern Britain and northern Gaul, as a precaution against these pirate raids. Those cities which did not already have defensive walls rapidly threw them up. 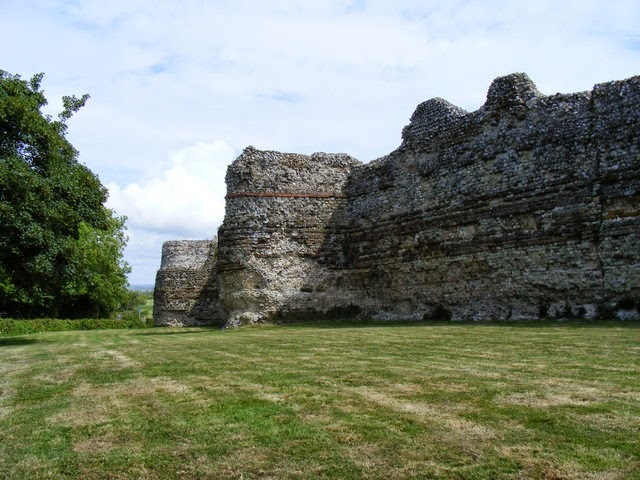 Pevensey Castle (Anderida): the outer wall was built in the late 3rd or early 4th Century AD; the moated castle at top right is a Norman addition. Photo: Lieven Smits (licensed under GNU). Britannia, however, had always been on the farthermost edge of the Roman Empire and, as the empire collapsed, it became an increasingly troublesome province. British forces played a key role in the attempted usurpations of Magnentius (353 AD) and Magnus Maximus (383-399 AD). By 400 AD, Roman Britain was, in effect, a failed state. Significant Saxon incursions occurred in 408 and 409 AD. Some towns found it easiest to pay individual Saxon war-bands to "protect" them, whilst others fell by force of arms. The Saxons who came, initially, as raiders, soon became settlers, bringing with them their own language, and their distinctive north European form of paganism. 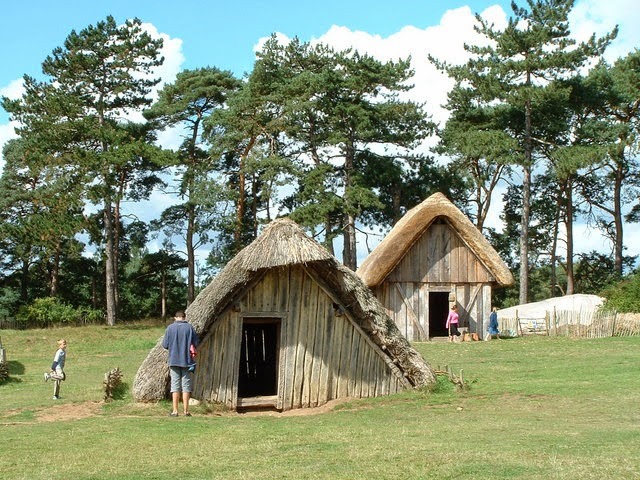 Reconstructed Anglo-Saxon settlement at West Stow. Photo: Keith Evans (licensed under CCA). 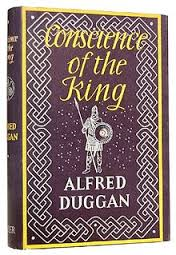 Alfred Duggan's Conscience of the King is a fictionalised autobiography of Cerdic Elingas, a historical figure about whom little is actually known, but who is considered to be the founder of the Saxon royal house of Wessex (the Kingdom of the West Saxons). Duggan, however, introduces a twist, in that his fictionalised Cerdic starts life in Sussex as a Romanised Briton (though with German ancestors, and therefore "Woden-born"), and only begins offering his services to Saxon war-bands when he loses out in a dynastic struggle at home. The novel is unusual in that its protagonist, Cerdic, is a difficult man to like. He is frequently cowardly, treacherous and brutal, the novel's title being deliberately ironic - one can question whether Cerdic actually has a conscience at all. He cooperates with others when it suits his purposes, but the only human being for whom he seems to have anything resembling love is his son, Cynric. His one redeeming quality, perhaps, is his honesty, at least in this written account: he at no point tries to hide or disguise his intentions from the reader. He is, at least, a reliable narrator. Through this narration, Duggan is able to paint a credible picture of what life in a failed state might actually have been like. "Before this scandal I had not disliked my elder brother in the least; he was an obstacle to my advancement, and one day I should have to deal with him; meanwhile we got on well enough together, for he could be a witty and amusing companion. But now I began to hate him as a person ... This was very unfortunate, for hatred made me act hastily ... I slipped the little seax-knife in my left hand into his armpit; he staggered wildly, and I stabbed him again in the big vein of his neck." "It may seem odd, but it is the fact that I felt no compunction about leading this attack on my native land. Constans had tried to take my fairly-earned plunder, and I had been compelled to stab him; I had finished with Rome, and with Christianity, and all the ways of civilised men; I was a Woden-born noble of the family of Aellinga, and a wolf to every peaceful sheep of Britain ... One peasant recognised me, and cried shame on me for a traitor before we cut him down; but my men understood not a word of Celtic, and thought he was only shouting defiance." The walls of Anderida, on which Cerdic leads an assault. Photo: Paul Farmer (licensed under CCA). "This episode worried me a little, for I did not want Aella to know that I was waging war on my father; no German would understand the excellent reason I had for such a drastic step. It would be wiser if in the future I kept in the background when men were being slain in cold blood, or it would seem curious that the victims always insulted me in particular." Behind this rather unusual narration, there are at least a couple of serious points. The first is that, in a failed state, a land with no effective law, men of conscience are unlikely to succeed. The second is that most "legitimate successions" in history have their origins in regimes that came to power through the sword. As Duggan points out in his postscript, Cerdic did, in fact, found the royal house of Wessex and, "Through Matilda, the Queen of Henry the First, the present royal family of Great Britain are Woden-born Cerdingas." The Roman Empire reached its high point during the reigns of the "five good emperors." The last of these emperors, Marcus Aurelius, generally thought of as one of the best, was succeeded by his son, Commodus, almost universally considered to have been one of the very worst. From this point onwards, the history of the empire is one of decline. Part of the problem, as Hadrian had well understood, was that the empire was becoming too big to be controlled effectively from a single centre. 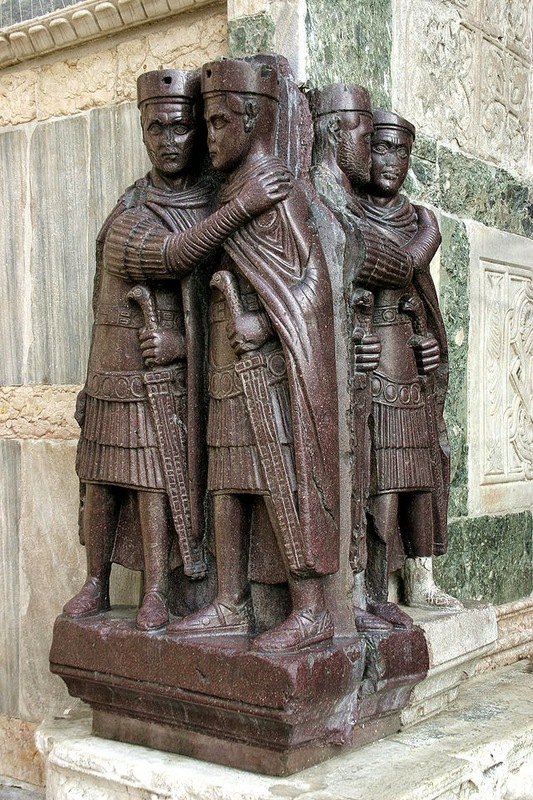 After a long period of civil wars, the Emperor Diocletian attempted to stabilise the administration by dividing the empire into four parts, with four "tetrarchs" sharing power between them. Nicomedia (Izmet, in modern Turkey) would be the base for the Eastern Augustus; Sirmium (in Serbia) that of the Eastern Caesar; Augusta Trevororum (Trier, in modern Germany) that of the Western Caesar; and, most surprisingly, Mediolanum (Milan), the capital of the Western Augustus, responsible for Italy and Africa. Rome itself would slip into increasing irrelevance. Four tetrarchs, late 4th Century statue now in the Treasury of St Mark's Venice. The way in which each tetrarch embraces a colleague with one hand, whilst gripping his sword-hilt in the other is an apt metaphor for the political realities of the system. Photo: Nino Barbieri (licensed under GNU). Constantine I fought his way to power over the whole of the empire in 324 AD, and managed to hold it together until his death in 337 AD. Although his reign lasted only thirteen years, he made two profound decisions which would change the history of the world forever. The first was to embrace Christianity (it is by no means clear that he ever did so wholeheartedly). The second was formally to move his capital from Rome to Byzantium (later renamed Constantinople). Head of a colossal statue of Constantine I. Musei Capitolini, Rome. Photo: Jean-Christophe Benoist (licensed under GNU). After Constantine's death, the empire was once more divided, this time between his three sons, all of them fervent Christians. One of these sons, Constantius II, appointed a cousin, Julian, as Caesar of the West but, at Paris, in 360 AD, his troops proclaimed him Augustus. Civil war looked inevitable, but Constantius died (apparently of natural causes) naming Julian his heir. As a young man, Julian had been baptised a Christian, and had studied in Athens under two of the leading theologians of the day, Saint Basil the Great and Saint Gregory of Nazianus. He had also, however, been initiated into the pagan mysteries of Eleusis. Saint Gregory of Nazianus, fresco from Kariye Camil, Turkey (image is in the Public Domain). As Emperor, Julian abandoned Christianity entirely (earning himself the epithet, "the Apostate"), and did everything possible to revive pagan traditions, temples and oracles. He even promised to rebuild the Jewish temple at Jerusalem. He presented himself as a restorer of traditional "Roman" values, but had never set foot in Rome, and his own religious beliefs owed more to the Greek than to the Roman tradition (he was strongly influenced by Neo-Platonism). Coin of the Emperor Julian. Photo: Classical Numismatic Group (licensed under GNU). A number of his letters and orations have been preserved, all of them in Greek, rather than Latin. They do, however, give us a more intimate picture of Julian, as an individual, than we have for most Roman emperors, including a clear insight into his sense of humour. This, naturally, has made him an attractive subject for writers of fiction. The American novelist, Gore Vidal, presents a sympathetic portrait of a man driven by philosophical curiosity and a quest for intellectual coherence (which, in Vidal's view of the world, Christianity has always lacked). Vidal's "Julian" is a fictionalised autobiography in the tradition of Robert Graves and Marguerite Yourcenar, but with one significant innovation. Vidal imagines Julian's autobiography being edited, after his death, by two of his former friends, Priscus of Epirus and the rhetorician and sophist, Libanius. It is a device that allows him to introduce a good deal of humour as they send often venomous notes to one another, and also to highlight the unreliability of the historical record. 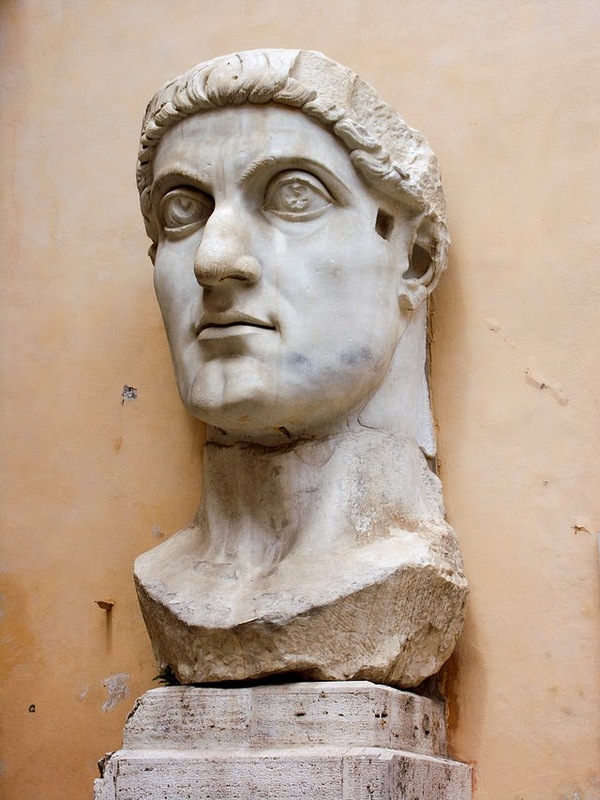 "From the example of my uncle, the Emperor Constantine ... I learned that it is dangerous to side with any party of the Galileans, for they mean to overthrow and veil those things which are truly holy ... From my cousin and predecessor, the Emperor Constantius, I learned to dissemble and disguise my true thoughts ... Yes, I was trying to imitate the style of 'Marcus Aurelius to Himself,' and I have failed. Not only because I lack his purity and goodness but because while he was able to write of the good things he learned from a good family and good friends, I must write of those bitter things I learned from a family of murderers in an age diseased by the quarrels and intolerance of a sect whose purpose it is to overthrow that civilization whose first note was struck upon blind Homer's lyre ..."
"I was admitted to all the mysteries, including the final and most secret. I saw that which is enacted, that which is shown, and that which is spoken. I saw the passion of Demeter, the descent of Persephone to the underworld, the giving of grain to man. I saw the world as it is, and the world that is to come. I lost my fear of death in the Telesterion when, in a blaze of light, I looked upon the sacred objects. It was true. More than this I cannot write. It is forbidden ..."
Priscus: "He tells altogether too much. But that was his charm ... I know that you were initiated at Eleusis and doubtless feel as much as he did about what is revealed there. I don't. ... I am cool to the mysteries, and find them vague and full of unjustified hope ... In any case, when Julian looked with adoration at that sheaf of wheat which is revealed with such solemnity ..."
Libanius: "This is absolute blasphemy! These things must not be revealed. Priscus will suffer for this in the next world, while whoever betrayed to him our high secret will sink forever in dung. It is appalling!" Ultimately, Julian's attempt to restore "Hellenism" (in itself, something quite different from the values of the Augustan tradition) was to fail. He had proved himself an able military commander in Gaul, but was defeated and killed in a campaign against the Persians in 363. His successors restored Christianity as the religion of empire. 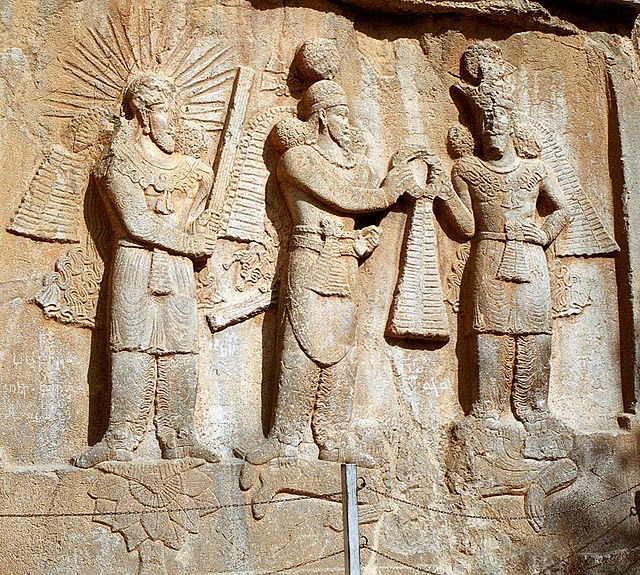 Sassanian (Persian) relief, showing the future Ardashir II trampling the body of the Emperor Julian, flanked by the divinities Mithra and Ahura Mazda. Photo: Philippe Chavin (licensed under GNU). Vidal's dialogue between the now dead emperor and his friends Priscus and Libanius allow him to side-step some of the questions that have vexed historians. Was Julian killed by the Persians, or by a Christian in his own army? Did he, as some sources suggest, claim to be a reincarnation of Alexander the Great? It all depends on who we, the readers choose to believe.